DETROIT — Alan Mulally says Ford Motor Co. is in a "race against the clock," and he has no idea whether Ford will win. In a startlingly candid comment, Mulally revealed uncertainty about the outcome of the struggling automaker's bid to turn itself around. But the CEO reaffirmed his confidence that Ford is executing the right strategy to fix itself. Last December, Mulally made his first big move by mortgaging almost all of Ford's assets in a $23.4 billion financing package. The big question: Will Ford's burning of cash reverse itself before the money runs out? Mulally arrived at Ford 14 months ago from Boeing Inc., where he led a turnaround of the commercial airplane division. Mulally, 62, told Automotive News that he is commonly asked, "Now that you've been here for a year, is it going to be OK?" His answer: "Don't know — race against the clock. Are we working on the right things? Absolutely. I've been there. I've seen this movie. I performed well in it. I know exactly what to do. Do we have enough time? No idea." But Mulally says he can't worry about running out of time. "The more you worry about worrying, as opposed to worrying about doing, then you're going to put this at risk," he said, slapping a piece of paper on which he'd sketched elements of his turnaround plan. "So let's just do the goddamn plan." The automaker's financial numbers and continuing sales collapse show its vulnerability. Ford Motor lost $12.6 billion in 2006. Ford is expected to post severe financial losses in 2007 — even though it reported net income of $468 million through the first half — and in 2008. Mulally has projected that Ford will make a profit in 2009 when its bread-and-butter North American unit is back in the black. Ford's turnaround plan, announced in January 2006 and amended eight months later, called for cutting about 14,000 white-collar jobs, trimming up to 30,000 manufacturing jobs by the end of 2008 and closing 16 North American plants. Ford wrangled with the UAW about those plant closings and other concessions during master contract negotiations. A tentative contract was reached Saturday morning. Ford had projected burning through $17 billion in cash from 2007 through 2009. In July, company executives reported that cash use had slowed, lowering the projected burn to $15 billion or $16 billion. Faced with the immense cash burn last fall, Mulally's first big move was taking out what he calls "the biggest home improvement loan in the history of mankind" — the $23.4 billion package. 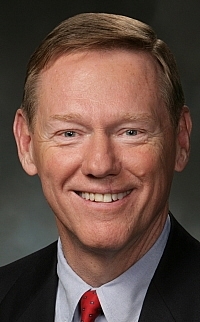 In the Automotive News interview on Oct. 26, Mulally said, "Our liquidity is good." Ford had $37.4 billion in cash on hand at the end of June. But what if the North American unit doesn't start making money in 2009? Could the money run out? In addition to running against the clock, Mulally is facing economic conditions that have worsened since Ford's turnaround plan was announced. Credit is tighter. Some economists fear a recession. And Ford's U.S. retail sales have been weaker in 2007 than planned. Ford Motor's total U.S. sales fell 9.3 percent in October and were down 13.0 percent through the first 10 months of 2007. Mark Fields, Ford's president of the Americas, last week affirmed that Ford will adjust its turnaround plan if results fall short or the economy worsens. Ford's storied history and desperate straits convinced Mulally to leave a 37-year career at Boeing. "I got a call about an American worldwide icon that's in trouble and needed help," he said. "I got down to: I couldn't say no. It was a chance to give something back." The always-upbeat Mulally publicly presents himself with a self- effacing, folksy persona. But during the interview, he was more revealing and passionate about his motivations and the environment in which Ford executives are working, including his fabled Thursday meetings. Early on, Mulally established regular Thursday meetings with his top lieutenants. He says those meetings are when top executives can review the company's progress without fear of being chewed apart for a misstep. Admitting problems was anathema in the cutthroat culture that met Mulally when he joined Ford. He's fond of telling a story about applauding Americas President Fields last fall when Fields shared technical problems in launching the Ford Edge crossover. Mulally's point: His executives must lay it all on the table so the rest of the team can help. But after the applause comes accountability. "You imagine how tense these meetings are?" he said. "This is not a warm, fuzzy thing. I'm here for one reason. It's not because ... I'm looking for another award. I'm here to create a viable company. And all I need are a few people ... that want to do that."